The nickelodeons were located in large urban centers and offered programs between ten minutes and one hour in length. By 1906 these “nickel theaters” were the industry’s dominant exhibition outlets. 1907 saw an explosion of nickelodeons in Chicago’s Loop and on the Near North Side and West Sides. There were about 158 in that year and this number doubled the following year. This was in addition to the vaudeville houses that still regularly screened motion pictures. Unfortunately many of the nickel theatres were located along State Street also known as “Whiskey Row.” This area was filled with saloons, scoundrels and brothels. With the rise of immigration from 1890 to 1910, the silent movies, with their universal visual language, were the best and cheapest form of entertainment. Had Pictures at the World’s Fair, but Its First House was Opened in 1904—Many Beautiful Theaters Today. THERE is little doubt that the first moving pictures ever seen in Chicago appeared during the World’s Fair in 1893. These were furnished by the Anchutz Tachyscope and the Edison Kinetoscope. In the Tachyscope a circular glass plate revolved in the cabinet of the machine, and the pictures, or photographs, appeared in succession as it turned, they being placed on the outer rim of the plate. As each picture came into position there was an incandescent flash in the cabinet, which brought it into view. The plate took only three seconds to revolve, so the picture show did not last long in those days. 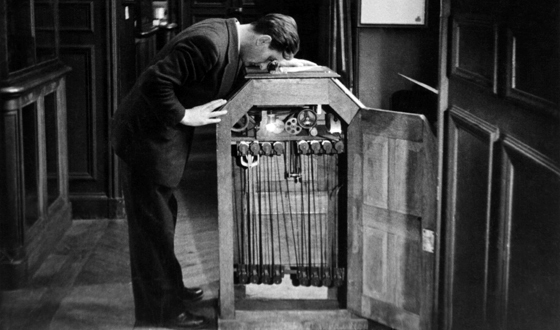 The Edison Kinetoscope, the first moving picture machine of a commercial character, and which used film of the regular standard now employed, namely, ¾ by 1 inch, was also a slot machine, the pictures being viewed as the film revolved in a dark cabinet chamber. The film used in this machine was opaque, the emulsion being placed over a ground glass base. Even if the present day film had been used in the machine, it would have been impossible to project it on a screen, as the film had a continuous movement and at that time the ingenious contrivance known as the intermittent sprocket had not been discovered. The discovery of this invention was due to Thomas Armat, of Washington, D. C, and it so effectively met the difficulty which had baffled all his predecessors and contemporaneous competitors that every projecting machine licensed by the Motion Picture Patents Co. made use of the device, or of the principle underlying it. The films used in the Kinetoscope were about 40 feet long, and the pictures appeared just the same size as they appeared on the film, namely, ¾ by 1 inch. The first Kinetoscope show in Chicago was located in the Ashland Block, on the northeast corner of Clark and Randolph streets, early in 1894. The machines were operated by placing’ a nickel in the slot, and a rushing business was done. First Moving Pictures Shown with High Class Vaudeville. The first moving pictures projected on a screen in America were not shown in moving picture houses, because there were none. They were used as an added attraction in high class vaudeville houses throughout the country. The pictures were furnished together with a machine and operator by various companies. The Vitascope and the Lumiere Cinematograph were first in order to furnish such service. The first Vitascope pictures were shown in 1895, and represented scenic views by the cameraman on the front of an engine in motion. George K. Spoor’s Magniscope Service. 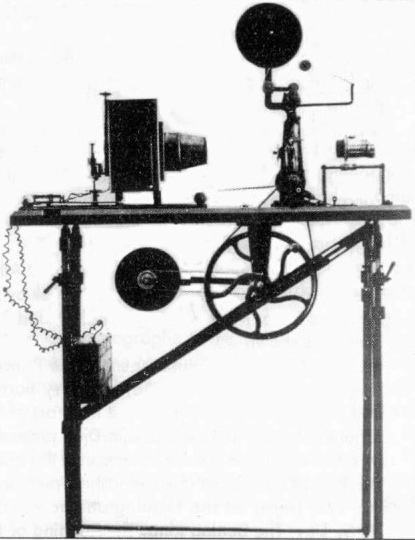 The Magniscope projecting machine, which had been invented by E. H. Amet of Waukegan, Ill., with George K. Spoor, now president of the Essanay Film Manufacturing Co., as financier of the invention, came out in the fall of 1895. Mr. Spoor was then running the Grand Opera House in Waukegan. the management of which he conducted from 1892 to the fall of ’96. The Magniscope service was first furnished to the John D. Hopkins circuit in Chicago, St. Louis and New Orleans, including the State Street theater, the old Columbia, owned by Frank D. Tate, and the Hopkins Grand, in order, in the cities mentioned. The Schiller theater, Chicago, now the Garrick. was also furnished with Magniscope service in 1896, when vaudeville programs were run in that house under the management of Robert Blei. It succeeded the Cinematograph service in that house, in that year. In the Hopkins and Tate theaters the Magniscope succeeded the old Jenkins Phantascope. The Magniscope paved the way for the Kinodrome, which was built for George K. Spoor by Don J. Bell, now of Bell & Howell, in the fall of 1897. The first machine was placed in the Grand Opera House, Syracuse, N. Y., then controlled by the Shuberts. George K. Spoor’s Kinodrome Service. The Kinodrome service established by George K. Spoor became famous throughout the country. It is understood, of and the operator. Mr. Spoor secured his pictures from Edison and through McGuire & Baucaus, 44 Pine street, New York, who at that time imported English films. These English films were made chiefly by Robert Paul, Mr. Houdin and George Melies, and were from 60 to 100 feet in length. They were trick films and took remarkably well. Types of Films Shown in 1896. The pictures shown in the Schiller in 1896 were not only scenic. Some of them showed action, such as taking horses out of a burning stable, a scene in “The Buffalo Horse Market,” “Feeding the Doves,” “Surf Scene at Atlantic City,” “Hurdy Gurdy Dance,” and “Washing the N***** Baby.” These films, as closely as Mr. Spoor can remember, were from 50 to 60 feet in length. The First “Store” Picture Show in Chicago. We now come to the advent of the first “store” moving picture show in Chicago. It can easily be imagined that there are differences of opinion on this question. Wm. N. Selig, now president of the Selig Polyscope Co., is certain that the Electric theater, located near the northeast corner of State and Harrison streets, and owned by Harry Davis, of Pittsburgh, was the first. Mr. Selig was running his Peck Court studio at the time, and was familiar with every happening in the amusement line in that section. It is his recollection that the Electric was opened in the spring of 1906, and that Gustav Hollenberg was the operator. Hollenberg had been induced to take the position by outside parties, who were anxious to learn what business was done in the new venture. After a few weeks Hollenberg found business so prosperous that he opened another house, called the Chicago, a few doors from Harrison street, on the southwest corner of State and Harrison. This house he afterwards sold to Jim Maher, who came to the city about that time from the west, and afterward became associated with Wm. H. Swanson in the Swanson Film Exchange. It will be interesting to add here that when Hollenberg left the Electric theater to take charge of the Chicago, Bill Swanson succeeded him as operator at the Electric. Now comes Aaron J. Jones, of Jones, Linick & Schaefer, as a claimant for the honor of having opened the first “store” picture theater in Chicago. Mr. Jones is certain that he opened a picture theater on S. State street, where Browning, King & Co.’s store now stands (next to the Palmer House), on Christmas day, 1905. He is perfectly certain of the date, from the fact that the big amusement park, White City, of which he was treasurer and a stockholder, was opened on May 27, 1905. He confidently states that the only other picture theater seen by him in the country before that date was the nickel show, on Smithfield street, Pittsburgh, run by Harry Davis. He visited that theater, the name of which he does not recollect, a month before he opened the nicked show referred to. 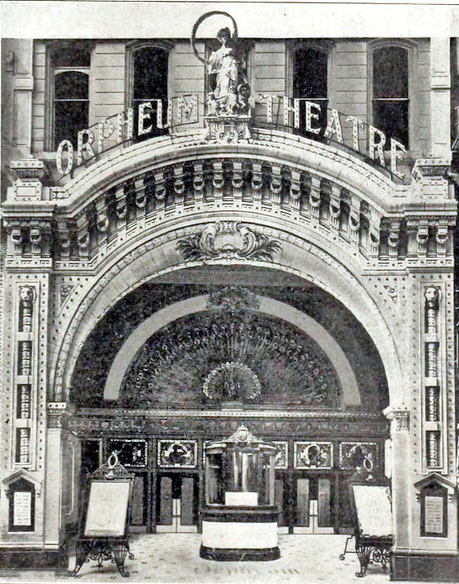 His lease on the ground was short, however, as he had to get out on May 1, 1906, having leased on the same date the present site of the famous Orpheum, on State street, opposite the Palmer House. This theater was built for high class vaudeville, and was opened on Oct. 1, 1916. Later, through inability to secure high-class vaudeville bookings, on account of the opposition of the Majestic theater, just around the corner, Mr. Jones turned the Orpheum into a moving picture theater. Orpheum Theater, Chicago, First High Class Picture Theater. This was a great boost for moving pictures, as everyone knew that the ground lease was costly. 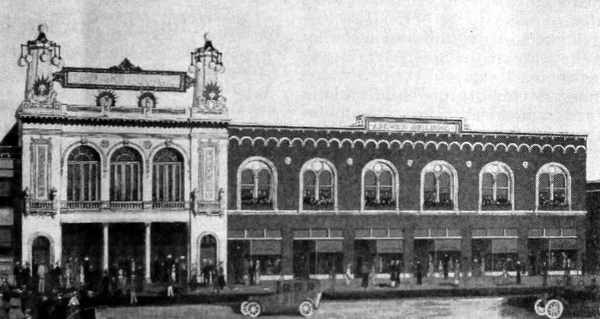 Business has been prosperous, very prosperous, indeed, ever since, and in the course of time the success of the Orpheum induced exhibitors with capital to get away from the old “store” theater into modern beautiful buildings. Electric Theater, State and Harrison, First “Store” Theater. But this is digressing. Mr. Jones, by no means, has the last word in deciding the question concerning the first “store” theater in Chicago. Ike Van Ronkel, well known in film circles as an able exchange manager for many years, entered the business as the owner of the Electric theater, Quincy and Halsted streets. That was on Feb. 1. 1906. Mr. Van Ronkel claims that the Electric theater on State and Harrison was opened bv the Riley Brothers, proteges of Harry Davis, of Pittsburgh, in November, 1905. Both Mr. Selig and Mr. Van Ronkel are agreed on the ownership of the Electric, and again both are agreed that it was the first “store” picture theater in Chicago. Mr. Van Ronkel states that the Nickelodeon on Halsted street. 50 feet north of Van Buren, was opened on Tan. 1. modern Newberry theater, 856 North Clark street, which seats 700 people; Harry Cohen, now widely known in film circles as an efficient film exchange manager, and D. L. Noon. He also holds that the Chicago theater was opened in the latter part of February or March, 1906. Four First Picture Theaters in Chicago. 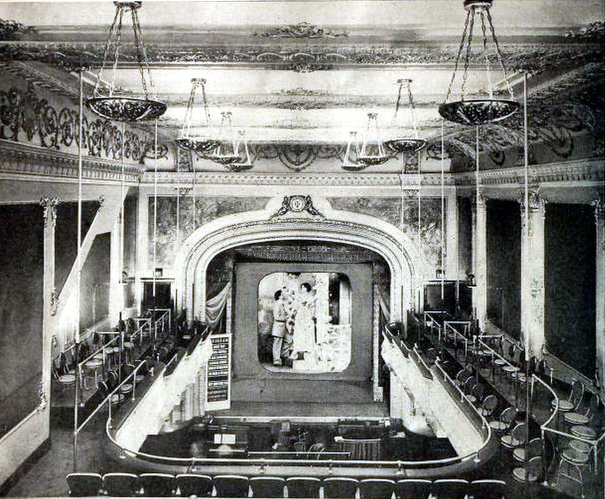 The data now furnished tends to show that the Electric theater owned by Harry Davis of Pittsburgh, was the first “store” picture theater opened in Chicago; that Mr. Jones’ theater, opened on Christmas day, 1905, was the second; that the Nickelodeon was the third, and Van Ronkel’s Electric the fourth. Type of Pictures in Early Theaters. In all these early theaters sensational pictures were the most popular. Mr. Van Ronkel is certain that he used films 400 feet and more in length of this type at his theater. The most popular at the time were “Escaped from Sing Sing” (Vitagraph), “The Great Train Robbery” (Edison), slapstick comedies of a primitive kind, and trick films, including “A Trip to the Moon” (Melies). Aaron J. Jones is certain that he used pictures 1,000 feet in length at his first house, including “The Great Train Robbery,” slap-stick comedies, and street chasing scenes, such as Pathe’s comedy showing the baker boy with a tray of pastry on his head being knocked down as he hurriedly goes out of the store, and the following mix-ups. Edison Machine Used in Chicago’s First Picture House. 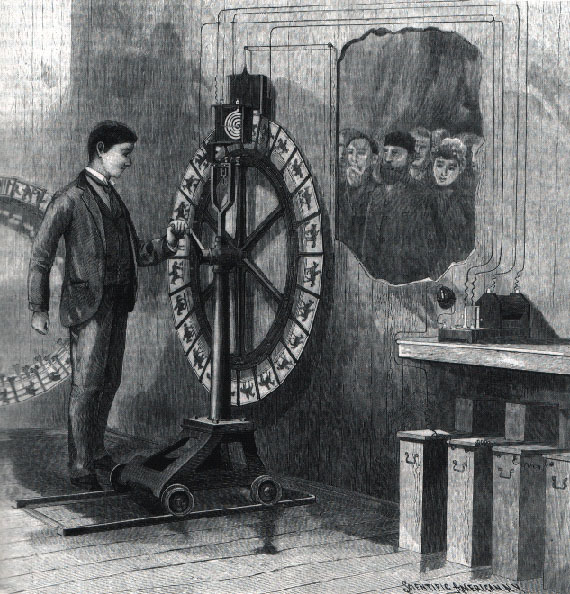 Muslin screens, either plain or sized, or a white wall, were used as a rule, in all these early theaters, and here it may be stated that an Edison projecting machine was used in the first “store” theater opened in Chicago. Panic of 1907 Boosts Moving Pictures. The panic in 1907 gave a tremendous impetus to the moving picture industry generally. During that year five-cent theaters grew and multiplied throughout the country. The scarcity of currency turned the amusement-loving public to the low-priced picture theaters and the oftener they went the more convinced they became that the new entertainment was not only novel, but exceedingly enjoyable and attractive. Hale’s Tours Cars in 1906. The Hale’s Tours cars came in vogue in Chicago in the spring of 1906. Aaron J. Jones put up the first in a store alongside Schaefer’s penny Arcade, at 306 South State street (the old number), the Arcade being 308. Mr. Jones simply took out the store front and ran the Hale’s car in, admitting people through the front of his store and giving them exit through the Arcade adjoining. The second Hale’s Tours show was opened by Mr. Jones later in the same year, next door north of the present Orpheum site. Of course, scenic pictures only were run in these cars. From the earliest days of the “store” shows, music of some kind was used with pictures. At first the phonograph was favored because of its cheapness. Illustrated songs had been used in entertainment as early as 1904, but they were used first in cheap vaudeville houses. In the fall of 1906 they were first used in picture theaters and became quite a fixture until about 1911, when they began to lose their hold on the better class of houses. They gradually dwindled until 1914, when only few could be found in any Chicago theaters. Several small theaters in small country towns still use them, but their day is over. As early as 1909 an attempt was made to play suitable selections on the piano, with drum accompaniment, for the pictures. None of these pianists at that time could improvise so as to catch the theme of the picture accompanied, with the result that patrons with musical ears soon tired of such music and preferred the pictures alone. It was not until men with the calibre of S. L. Rothapfel arrived that real interpretative music accompanied the pictures. That was in 1911 at the Alhambra, Milwaukee. It must not be inferred, however, that Mr. Rothapfel was the only man of this type in the business at that time. There were others who aimed at the same work, but did not succeed in getting into the limelight so strongly. From 1908 until 1911 the progress of moving pictures was seriously retarded by the introduction of cheap vaudeville acts between films. The custom was introduced by manager’ who had formerly run cheap vaudeville theaters, and who were unable to hold moving pictures at their true value. It will be recalled that the panic of 1907 added large numbers of new patrons to picture theaters, and that the attendance had steadily increased. Most of these patrons were people of refinement and intelligence and resented being annoyed by vulgar and rough entertainment. They were willing to take pictures at their worth, and that was sometimes pretty low, but they would not tolerate the attempts made by “ham fats” and “low brows” to amuse them. A campaign against cheap vaudeville was carried on in the old Film Index by the writer for nearlv two years, with the result that the managers and owners who did not really like low vaudeville intermixed with their pictures, but who at first had been frightened into its use through fear of having their business diminished by their competitors, soon discarded vaudeville. Their business grew, and in the course of time their competitors learned that they were playing a losing game. Organ or orchestral music and vocal numbers soon took the place of cheap vaudeville acts. Gradual Disappearance of the Old “Store” Theater. The survival of the fittest has been forcibly demonstrated in the history of the “store” theater. As the call of the moving picture increased the patronage of the refined class it soon became manifest to exhibitors of intelligence that they must provide better homes for picture entertainment. The new houses were well appointed and equipped. The “dark” house was a thing of the past and health ordinances calling for good ventilation were rigidly enforced. The old “store” theater could not meet the requirements and it was closed. Even when the small house succeeded in complying with the law, it was soon forced out of business bv the larger, modern house which had been built near it. That appears to be the prevailing rule in all large cities and in all cities and towns of importance. The trend is ever toward progress. Better pictures, better projection, better music, better management, betterment in everything is required, in addition to better houses. The public has become enlightened on the whole business and will not be denied. From 1914-16 a wonderful growth in new modern picture theaters has been shown in Chicago. Three big circuits of new structures have come into being. The largest of these and the most costly is owned by the Ascher Bros., Nathan, Harry E. and Max. The two other circuits are comprised of leased theaters, and are controlled by Alfred Hamburger and Lubliner & Trinz. On the Ascher Bros, circuit are the Oakland Square, Drexel and Oakwood boulevards; the Columbus, Ashland avenue and 63rd street; Terminal, Lawrence and Spaulding avenues; Caldo, Clark street and Balmoral avenue; Lane, Center street and Lane center; President, 55th street and Calumet avenue; Frolic, 55th and Ellis avenue, and the Cosmopolitan, Halsted and 79th streets. All of these theaters, with the exception of the President, were built by the Ascher Brothers. The Oakland Square has a capacity of 1,525, and cost $200,000. The remaining theaters have a seating capacity of 1,000 and cost from $150,000 to $200,000 each. Organs and five-piece orchestras are installed in all the Ascher theaters, and appropriate music accompanies the pictures. Three new theaters for the Ascher Brothers’ circuit are now under construction, and will be completed in September. Each will have a seating capacity of 1,500. Argmore (800), Argyle and Kenmore avenues. In addition there are seven smaller houses on this circuit. Each of the larger houses has an orchestra and organ. The Lubliner & Trinz circuit, is comprised of the following houses: The Biograph, 2433 Lincoln avenue; Vitagraph, 3137 Lincoln avenue; Paramount, 2648 Milwaukee avenue; Knickerbocker, 6225 Broadway, and the South Shore, 6855 Stony Island avenue. Each of these theaters seats 1,000 people, and each has an organ and an eight-piece orchestra. The organs used are known as the Wangerin-Weickhardt, made in Milwaukee. Three other theaters are now under construction and will be completed in September. Each will seat from 1,500 to 2,000 people. 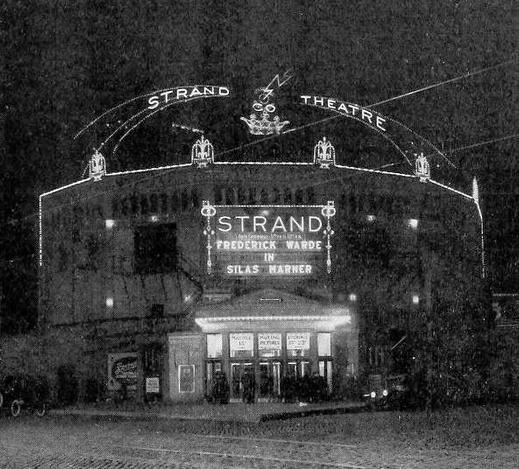 Strand (1,500), Wabash and Seventh street, Strand Theater Co. The last-mentioned theater, the Strand, has a thirty-piece symphony orchestra, the finest in the city, to play moving picture accompaniment, and the programs are high class. The Orpheum, on State street, has employed a fine orchestra for a long time, and the pictures are accompanied by appropriate music. The Parkway has an orchestra of six pieces and a large organ. All the others mentioned, which are singly owned, have an organ and piano.—JAMES S. McQUADE. Moving Picture World (1907-1919), was one of the earliest trade papers of the motion picture industry. The heyday of Moving Picture World was during the 1910’s and the period that film historians have called cinema’s “transitional era” (lasting roughly from 1908 to 1917). As a series of dramatic changes swept the industry, including the rise of the star system, the transition from short films to features, the transformation of the viewing experience from the nickelodeon to the movie palace, the decline of the Motion Picture Patents Company (generally associated with its largest stakeholder, Thomas Edison), and the rise of “Independent” companies that became the Hollywood studios.